Editor’s Note: The following article by Todd Sepulveda describes why a notebook is an essential tool for preppers. Todd runs the wildly popular Prepper Website and Ed That Matters among others. Prepper Notebook and What Should Go In It! Preppers value information. You read articles, listen to podcasts, buy books, watch videos and create lists. All the information that you gather is useful. But where do you store this information? Many preppers gather so much information, that if they don’t keep it safe somewhere, they will forget it! It is important that you have one central location where you record your preparedness plans, thoughts and checklists. A prepper journal or prepper notebook is something you should add to your preps immediately! What Should Go In a Prepper Notebook? A prepper notebook is a journal where you would keep your preparedness plans, thoughts, ideas, checklists, procedures and specific skills that you want to make sure you know. Here are some examples of what you might want to record in your prepper notebook. lists of bank accounts, credit card accounts, etc..
Related: The Power of the Prepper Compound and the Curse of Doomsday Preppers! This is just a sampling of what can be included in a prepper notebook. So why should you start and maintain a prepper notebook? In an emergency, you might have some great preparedness plans ready to be executed. But do you have them written down anywhere? Sometimes ideas that we have in our head seem a lot easier to implement. When you put your plans down on paper, you are able to think more logically and rationally. You can make sure that your plans don’t have any missteps. After you have your plans on paper, ask someone to look over them to make sure they make sense to them. You want a family member to be able to implement your plans in the case you are not able or around to do so. Having important information written down in a prepper notebook is a good way to ensure you have it when you need it! In a crisis situation, you might not be able to remember certain HAM frequencies, directions to certain locations (like a cache) or procedures to use a specific piece of gear. You might have great ideas, but being in a crisis situation can shock the best of us. When you write down your ideas and notes, you can easily access them without having to lose precious moments remembering specific details. All you will have to do is open your prepper notebook and read what you have already written. Life happens and plans change! If you don’t revisit and review your preparedness plans on a semi-annual or annual basis, you might not consider how the changes that you and your family have experienced throughout the year might not fit into your preparedness plans. Your prepper journal should serve as the place where you keep your plans so you can easily review them. This might take as little as 15 minutes. But the process will keep your plans fresh in your mind and will allow you to recognize if they need to be adjusted. If you have to bugout, more than likely, it won’t go as planned. A bugout means you need to quickly leave your home. In that instance, having a prepper notebook that you can easily throw into your bugout bag will be very valuable. As mentioned before, many things go through your mind during a crisis situation. Having your important information written down will be invaluable when you need to recall important information during a bugout. This reason is the one we don’t want to think about. We prep so we can mitigate the suffering our loved ones would have to go through in a crisis situation. But what if you’re not around? In an ideal situation, every member of the family is skilled in the preparedness lifestyle. But, I have heard from many throughout the years that this isn’t the case. Many men and women are solo-preppers. Their family might or might not be on board with their prepping. But, they don’t themselves prep. In the case you weren’t around, a Prep Journal would be a great resource for your family to have in a crisis situation. Let me explain this idea further. John sees the crazy world around him and understands the need to prepare. At first, his family thinks he’s gone off the deep-end. However, after a blizzard took out the electricity and access to the main highway, his family was grateful that he had supplies and ways to keep the family warm. But although they recognized the advantages of prepping, the family left it all up to the “man of the house” to take care of the family. One day, John was driving home from work when a vehicle pulled out in front of him on the highway. John was killed instantly. His family was left with all of the preparedness supplies that John had purchased and stockpiled, but they were unsure where to start and how to use all of it. And to make it worse, winter was right around the corner. Paul sees the crazy world around him and understands the need to prepare. At first, his family thinks he’s gone off the deep-end. However, after a blizzard took out the electricity and access to the main highway, his family was grateful that he had supplies and ways to keep the family warm. As the whole family recognized the advantages of prepping, they took a little bit more interest in preparing for hard times. One day, Paul was driving home from work when a vehicle pulled out in front of him on the highway. Paul was killed instantly. Paul’s family continued prepping. After all, winter was coming and they wanted to be ready! One day, Paul’s wife was going through his desk. She found his prepper notebook. As she read the notebook, she found all sorts of plans and ideas that Paul had. She also learned about some ways of doing things she didn’t previously know. She was truly grateful that Paul had left this notebook. Every member of the family read Paul’s prepper journal. It was a special keepsake that they all treasured. There are many reasons to keep a prepper notebook. The important thing is to just start! Start recording your plans, thoughts, ideas, and checklists. You never know how valuable a resource you are creating for you or your family! Don’t skimp on your notebook. This resource is important and you should invest in a quality journal. Don’t just get a cheap spiral out of the school supply section of your local big box store. Find a good hardback that will last a long time and something compact enough that you can carry it with you and even put it in your bugout bag if necessary. You can find journals and notebooks all over the place. 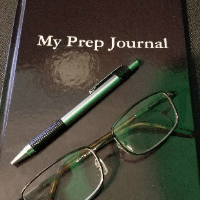 But if you would like to purchase a prepper notebook and support Prepper Website at the same time, you can purchase “My Prep Journal.” This journal has hardback binding and over 100 pages of lined pages that you can use to record your preparedness plans, thoughts, and lists. There are also over 50 starter questions that you can use to get you thinking about what to start recording in your journal. 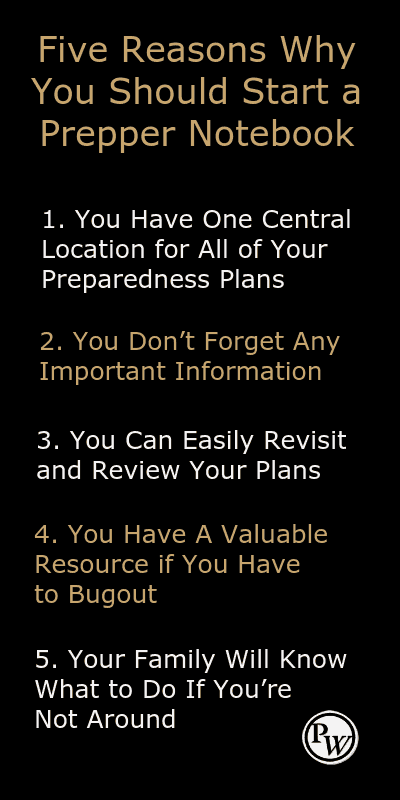 When you take the time to create a prepper notebook, you are saying that you care about your preparedness plans. You are creating a valuable resource where your plans can easily be accessed and reviewed. You are making sure that you don’t forget any important detail and taking the time to make sure it is logical and understandable. 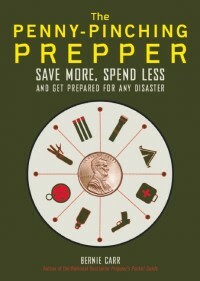 Lastly, you are creating a resource that will be highly valuable to the next person who picks your prepper notebook up. And who knows, you might be creating a valuable heirloom that your children would want to pass down someday. This can also have your check sheets for you “bug out” plan. So you do not leave something behind in an emergency. I have found under stress I “Check Sheet” is a very good thing to use. It is very easy to forget to pack or take something when time is critical. I would also suggest adding inventory pages for all your per-packed bags and containers. And label the outside on the bags and containers with numbers or some other way so you know what bags and containers to grab. Hi Oldguy, Thanks for these additions. Check sheets are helpful to have on hand.